I gave a talk on ‘The script and language of the Voynich manuscript” on Thursday 10th April 2014 at the University of Bedfordshire in Luton. Click here to see the video. The fascinating Voynich manuscript has been described as the most mysterious manuscript in the world. The vellum on which it is written has been carbon dated to the 15th century. Unfortunately, since it was rediscovered in 1912 not a single word of it has been deciphered. René Zandbergen’s comprehensive website gives a lot of excellent historical and other information about it. My research into the Voynich manuscript looks particularly at the script and language, and as a result of my research I propose a decoding of around ten of the words and some fourteen of the signs and clusters. I suggest that these are the first signs and words to be successfully decoded, but of course the results are partial and provisional. I hope that other analysts will now be able to comment and perhaps build on the results published here. 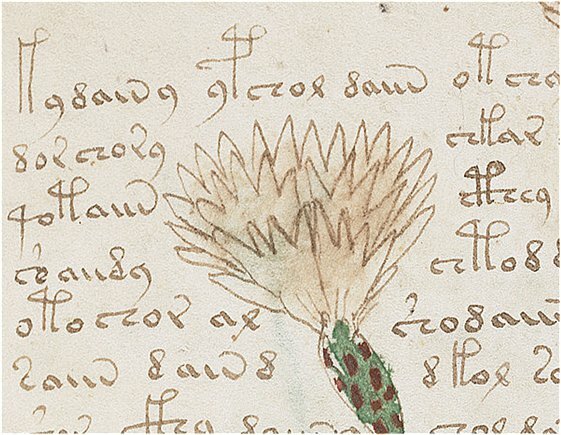 If you have any ideas about Voynich plants and plant names, you can add your views here. You can see an informal video of my Feb 2014 paper and findings here and also on YouTube. In my approach I used a systematic process of focussing on possible proper names in the text, in the way which was been successfully used before in the decipherment of Egyptian hieroglyphs and the Cretan Linear B scripts. Yale Library, where it is located. Jason Davies’ website where you can see every detail of the whole manuscript. 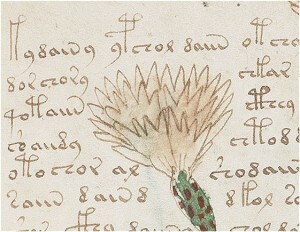 Edith Sherwood on the Voynich plants.